For more information on gardening for bees, have a look at www.helpthehoneybee.co.uk who made the video above. Keep coming back to this post for more links about gardening for bees – and please think about leaving at least a strip of land that can grow wild. You can mow it once or twice a year when flowering has finished and seeds have set. 25 & 26 February is the 2012 Fête de Violettes in Tourrettes sur Loup (06). it is the only place in France where the cultivation of violets is still the sole or principal form of culture for about eleven families. With the spring season in mind, Sue and I thought that pruning would be an appropriate topic for this months' Garden Group Meeting. This winter with the amount of snow that has fallen, many of our trees and shrubs have been damaged and need to have their dead, diseased or damaged tissue removed. So why do we prune, what is the correct way to prune, and at what time of the year do we prune? 1. To maintain or reduce plant size. 2. Removal of undesirable growth. 3. Remove dead, diseased or broken branches. 4. To stimulate flowering and fruiting. 5. To rejuvenate and restore old plants to vigorous growth. 6. To prevent damage to life or property. 7. To shape plants into an artificial form. 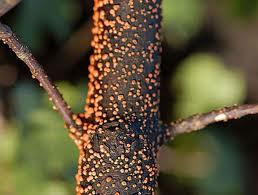 Trees have their own way of dealing with injuries to their branches, they are able to limit the spread of disease by transporting protective chemicals to the site of the wound, they form a barrier across the stem, isolating the diseased part from the main body of the plant. If a plant has already formed a natural protective barrier between live and dead wood, never cut below it, or the plant will have to form another barrier (scar tissue). It is however preferable to remove dead wood as it may harbor organisms that could become a source of infection. 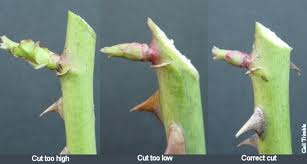 When a plant is damaged, a clean cut beyond the damage, will heal more quickly than leaving the wound to heal by itself. Do not use wound paints. They do not assist the healing process, they may even hinder it. Coral spot spreads quickly and needs to be cut well back to where the surface and interior of the branch are completely healthy and clean. 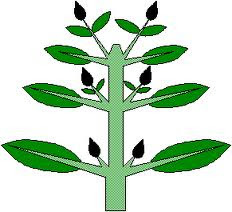 If a plant has several branches, the damaged stem can be cut out at the bottom. If your plants have frost damage - prune back to a clean bud after the likelyhood of frost has passed. Trees and shrubs that flower before the end of June should be pruned immediately after floweringowering. 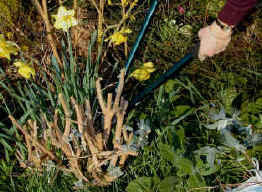 Trees and shrubs which flower after the end of June should be pruned in winter or early spring before new growth begins. Evergreen shrubs are best pruned between mid to late spring. Prune stone fruit in the summer, winter is dangerous because silver leaf and cankers may gain entry through the wounds. Most trees and other fruit trees are pruned in winter when the tree is dormant. Each of our members will receive an email with as an attachment a guide with detailed pruning instructions in alphabetical order, season by season. 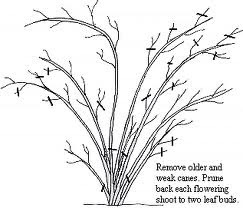 There are different ways of how to prune shrubs. Some shrubs are pruned each year back to a framework, this include Buddleja, Caryopteris, Perovskia and many others. In our guide it is mentioned when a shrub is pruned back to a framework. Or like Forsythia, Philadelphus, Weigela and many other shrubs where each year a few of the oldest branches are removed and the other branches are cut back to give an overall pleasing effect. How to prune a rose is very much dependent on what type of rose it is. Below is how you prune a Modern Bush Rose (Hybrid Tees, Floribundas, Patio, Polyanthus and Miniature Roses belong to this group). With evergreen shrubs, it does not look very nice when you can see where the shrub has been pruned, take the cut just inside the shrub to hide it. Most of the cellular activity of the plant is at the soft green shoot tips, just below the top most bud (the apical bud), this is the growing point or leader. 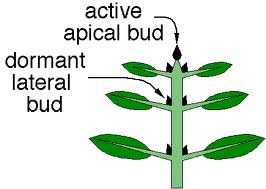 It is the apical bud that imposes on the plant what is called "apical dominance". This means that only when the tip of the plant has grown away strongly, will hormones move down the stem to allow growth of the side buds (lateral buds). 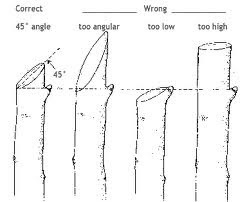 This explains that when we remove the apical bud (when we prune the branches), we take away the apical dominance of the plant, which stimulates the lateral buds to start growing. In 2011, the Pesticide Action Week represented nearly a thousand grassroots events across France and 16 countries : conferences, film shows, theatre shows, outings, open doors, exhibitions, workshops, information booths, farmer markets, organic meals … and hundreds of media hits ! Add your voice to this expanding international movement : get involved ! Help us to build an international event that gathers together thousands of grassroots events with the same message: it’s time to get rid of pesticides! The more countries that take part in the event, the stronger the message will be. It is when we come together that we truly feel the strength and power of this movement. No need to have lots of money, lots of logistics or a seasoned experience, every single action is important and amplifies the movement. Every single person, association, company, local government, teacher etc. can participate at their own scale. Actions can range from 10 persons visiting an organic garden to a 500 persons attending an international congress ! Be inspired to hold your own creative action and plan an event for 20–30 March 2012 ! Les températures sont au-dessus de la moyenne. Mais l’hiver n’a pas dit son dernier mot et nous ne devons pas lever vigilance et patience au jardin. Comme le font la plupart des plantes en hiver, le jardinier se repose. 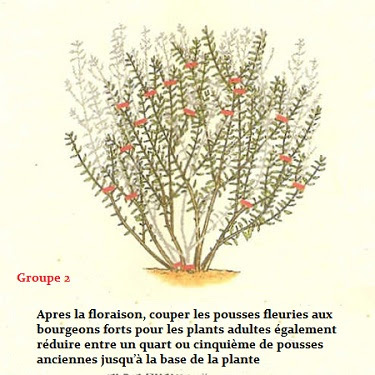 Par contre, bien au chaud, il faut entretenir son matériel, semer fleurs et légumes sous abri, faire le plan de son potager pour bien l’organiser. Les belles journées ensoleillées et les plus clémentes sont à réserver aux tailles fruitières réalisables. Les rosiers et arbustes à floraison estivale pourront aussi être régulés par des tailles appropriées. Au Potager, le semis des fèves et des petits pois doit se faire maintenant en profitant des périodes plus sèches pour bien préparer le sol. Je vous conseille de n’apporter aucun compost à ces légumineuses qui ont pour faculté de « fixer » l’azote de l’air sur leurs racines. Sous abri chauffé vous pouvez semer les tomates, courgettes, melons pour les plantations d'avril ou de mai. Les Rosiers seront taillés à partir du 15 février dans les zones bien protégées. Ailleurs, cette opération s'effectuera en mars pour ne pas prendre de risque avec les froids de printemps. Le dicton nous dit : "Taillez tôt ou taillez tard mais taillez en mars". Je conseille des tailles modérées qui consistent à « rajeunir » le rosier sans tailler court. Les plantes sensibles au froid resteront encore sous abri. Les serres et les vérandas ont besoin d’être bien aérées lors des belles journées ensoleillées. Il faut aussi veiller à la présence d'insectes comme les pucerons, acariens et surtout les cochenilles. Les plantes en pot peuvent être rempotées pendant cette période de repos végétatif. Qu'elles soient d’intérieur ou d'extérieur, si elles sont trop à l’étroit, donnez-leur un contenant légèrement plus grand avec un renouvellement du terreau. N’oublions pas que les racines d’une plante sont en perpétuelle croissance. Elles finissent toujours par envahir l’espace restreint d’un pot. Nous devons alors réguler l’équilibre entre les racines et les parties aériennes. Il faut tailler ces racines qui souvent, forment un amas au fond du pot. Cette taille s’applique aux plantes d'intérieur et d’extérieur en pot comme les rosiers. Tous les 5 ans, ils seront sortis de leur pot, mis racines à nu, et rempotés avec un nouveau mélange de terre (avec 20% d’éléments drainant comme du gravier par exemple). For plants to grow they need food, water, light and the right climate. They like to expose the maximal amount of leaf area to the sun to optimise the process of photosynthesis. The Greek word of "Photosynthesis"('photo' meaning 'light' and 'synthesis' meaning 'putting together'), is a chemical process that converts carbon dioxide with the help of water and light energy into organic compounds (mostly sugars) and oxygen. The sugars are used for the immediate needs of the plants, the rest is stored in structures like tubers and bulbs, the oxygen is expelled into the air. Photosynthesis is vital for life on earth, it maintains normal levels of oxygen in the atmosphere. The process of Photosynthesis starts when light energy is absorbed by proteins held inside the Chloroplasts, situated principally in the Palisade layer of the Mesophyll area of the leaf, just underneath the Epidermis (the exterior coating of the leaf or stem of a plant). Inside these Chloroplasts are Thykaloid membranes, these membranes contain Chlorophyll. Some of the light energy gathered by the Chlorophyll is stored, the rest of the light energy is used to remove the electrons from water. These electrons are then used in the reactions to turn carbon dioxide into organic compounds (especially sugars) and oxygen. Another important part of the leaf is the vascular bundle. 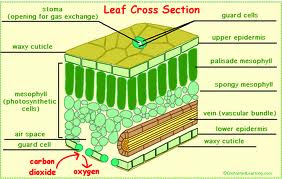 It is the transport system of the leaf and contains xylem and phleom vessels. Xylem (made up of dead cells), transports water and some minerals. 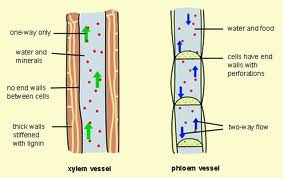 Phloem (made up of live cells) carries a water based solution rich in sugar, to wherever the plant needs the sugar and storage areas such as tubers and bulbs.